November still seems like a while away, but we're coming up on the five-month mark until Summit delivers the final installment in The Twilight Saga with Breaking Dawn Part 2. So it really isn't too soon to start seeing glimpses of the new and returning characters. We've already gotten a couple of peeks at the movie. 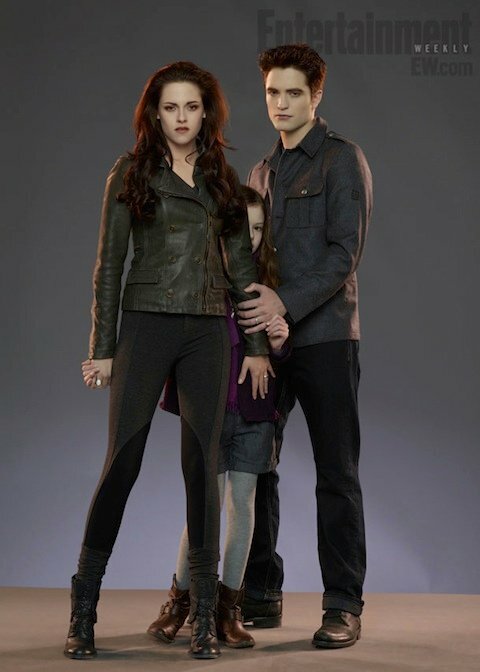 But now we have our first (official) look at the newest member of the Cullen clan. On a related note, Is it me, or does Edward's hair look bigger? Or have I just gotten used to seeing Robert Pattinson with other hairstyles? As for Stewart, the vampire look seems to suit Bella, whom we might hope to see showing off her newly-acquired strength and speed when The Twilight Saga: Breaking Dawn Part 2 arrives in theaters November 16. More on the film can be found in our Blend Film Database. Also, a heads up! EW's Facebook page says to visit EW.com tomorrow for "the full reveal," so there may be more to come tomorrow!